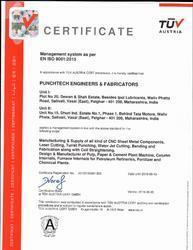 Established in the year 2006 we, “Punchtech Engineers & Fabricators”, has etched a remarkable name in the domain of providing services and manufacturing for Writing Printing Paper Machine, Refractory Anchors, Shearing Services, Press Brake Services etc. These products are widely appreciated for their trouble free operations, easy installation, longer service life and high tensile strength. Our modern infrastructure facility includes requisite machinery and contemporary tools, which help us in developing these products for our clients. Furthermore, our quality auditors test these machines after regular intervals to ensure that these are defect free. The team of our qualified professionals constantly helps us in performing all the business activities in a streamlined manner. The logistic staff employed by us makes sure that all these products reach the clients' destination within the pristine state. Wide distribution network set by us help us in delivering all the finished products at the clients' doorsteps within the stipulated time frame. Austlow Farming System Pvt. Ltd.
Parker Hannifin India Private Ltd.
Menzil Engineering (i) Pvt. Ltd.
Manufacturing and Trading of CNC Laser Cutting, CNC Bending and Fabrication services. ‘Mr. Vikram Panchal’ started from his father's business of heavy sheet metal shearing and section bending. He worked under the firm name M/s Dajibhai Kika & Sons located in Goregaon, Mumbai, India. Then to serve complex profile cutting industry, he started CNC Punching, CNC Laser Cutting and CNC Bending machine services. He decided to serve more with such manufacturing facilities of Column Internals, Column Trays, Refractory Anchors, Mounting Brackets and Random and Structured Packing for Petroleum Refineries and Fertilizers. Also started Manufacturing of Papermill Machinery and Pulp Equipment. As the quality conscious organization, we strive to develop excellent quality Writing Printing Paper Machine, Refractory Anchors, Shearing Services, Press Brake Services etc. for our clients. Our quality analysts check these CNC products at our well-equipped testing unit. These professionals make use of advanced testing equipment and latest technology while testing these CNC products. By adopting quality management policy, our organization has achieved huge success in this domain. Furthermore, we use optimum quality material while developing these CNC products. We are supported by a team qualified and adroit professionals, which holds a vast experience in the respective domain. Their meticulous efforts and dedication have helped us in achieving various goals and objectives laid down by the organization. We have recruited these professionals after assessing them on certain aspects such as educational qualification, experience, expertise and industry knowledge. Furthermore, we conduct various training sessions and workshops to keep them updated about the prevailing trend in the market. As a client-centric organization, we aim to provide best quality products and services for our valuable clients. Owing to our high-quality CNC products and client-oriented policies, we have developed the long-term business relationship with our trusted clients. In addition to this, we check these CNC products from time to time to assure that these are in compliance with the prescribed global standards. Our logistic personnel delivers these products at the clients' destination within the specified time frame. Chino Corporation India Pvt Ltd.
Menzel Engineering (i) Pvt. Ltd.
Godrej & Boyce Pvt. Ltd.
Over the years, we have emerged as a notable manufacturer and service provider for Petroleum Refineries & Fertilizers, Papermill Machinery & Pulp Equipment and CNC Punching Laser cutting and Bending Services etc. Superior quality products, cost-effective prices, client centric approach and on time delivery are some of the attributes that make us stand ahead of our counterparts in the business. Our ethical philosophy and excellence in client handling have gained us huge respect in the industry.